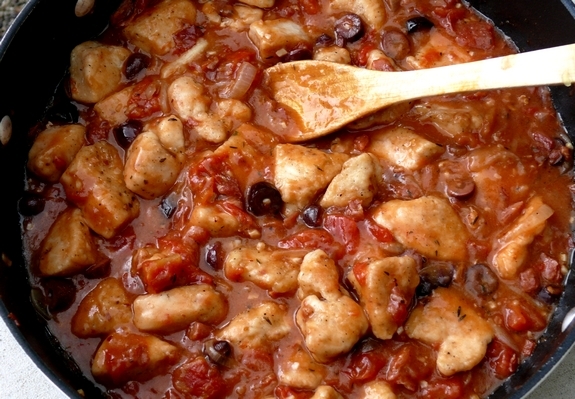 Chicken Marengo is an amazing Italian savory dish named for being themeal Napoleon Bonaparte feasted on after the Battle of Marengo (a battle between the French and the Austrians in the 1800s). Apparently Napoleon demanded a quick meal once the battle ended. His chef was forced to come up with something great with only meager supplies on hand; chicken (and some eggs), tomatoes, onions, garlic, herbs, olive oil and crayfish. The chicken was allegedly cut up with a sabre and fried in olive oil. A sauce was made from tomatoes, garlic and onions (even some Cognac from Napoleon’s flask) while the crayfish was cooked up on the side and all was served over eggs with some of the soldier’s bread ration on the side. Napoleonraved overthe food and since he had won the battle, considered this dish lucky. On future occasions Napoleon refused to have the ingredients altered, even when his chef wanted to omit the crayfish. Modern versions of this dish, such as this one, leave out the crayfish and add olives for flavor. Serving this over polenta also makes this comfort food to the max. The flavors are over the top and you will love how moist the chicken becomes. You have to try this, you will love, love, love it!! 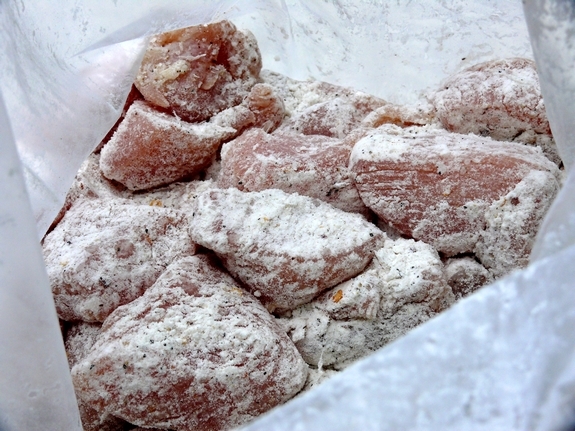 Combine flour, kosher salt, black pepper and red pepper flakes in a plastic bag. (If you are serving to children, I might suggest leaving out the red pepper flakes as it gives it a bit of a spicy kick.) Add chicken and toss to coat with flour mixture; set aside. Saute prosciutto in oil in a large saute pan over medium-high heat until crisp, 5 minutes. 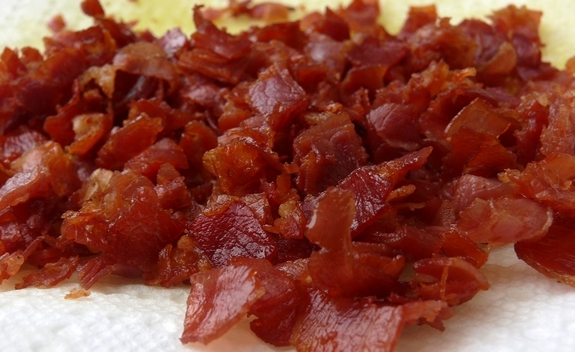 Remove prosciutto to a paper-towel lined plate; set aside. Saute onion in same saute pan over medium-high heat until softened, about 5 minutes. Add garlic and thyme; cook 1 minute. Deglaze pan with wine, scraping up bits on bottom of pan, and reduce until evaporated. Add tomatoes, broth and olives; bring to a boil. Reduce heat to a simmer. Return chicken with residual juices and prosciutto to the pan; simmer to thicken stew, 5 minutes. If you want it thicker, you can always dissolve one Tablespoon of cornstarch in 1 Tablespoon of water and add itslowly to the stew. Stir in lemon juice. 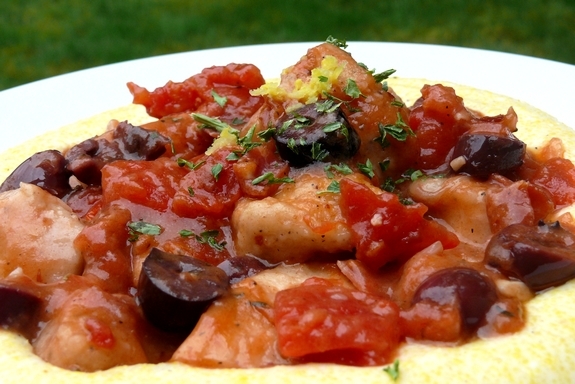 Serve stew over Lemon-Pepper Polenta (recipe below). Garnish with lemon zest and parsley. Boil milk and water in a large saucepan. While coming to a boil add in salt, pepper and lemon zest and slowly start adding in cornmeal, whisking constantly until thickened, about 5 minutes. Stir in cream cheese until melted. I can see you guys are getting ready for fall. Love all these comforting dishes!! 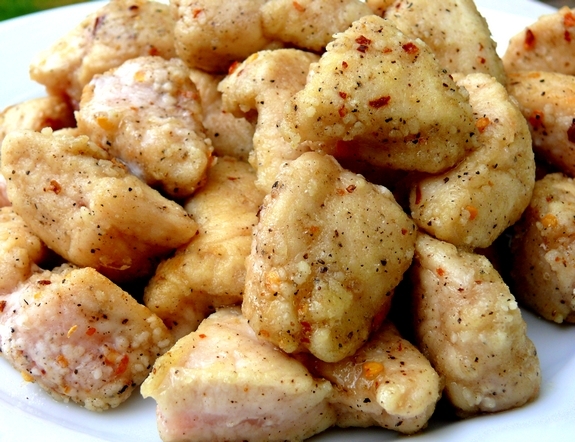 You can do some great things with chicken, because the flavor is so mild! Great fall dinner. Wow, this looks fabulous. Funny how our cooking style changes with the onset of fall. Love the braises! My grandfather used to make this. I have’t hat it in forever. I think I might make this over the weekend. There’s something somehow very Napoleonic about describing all those ingredients and cognac as meager, don’t you think? A man for whose ambition the world would never have been enough must have been a difficult diner to please, but this dish certainly looks fit for an emperor! I really really appreciate this recipe. 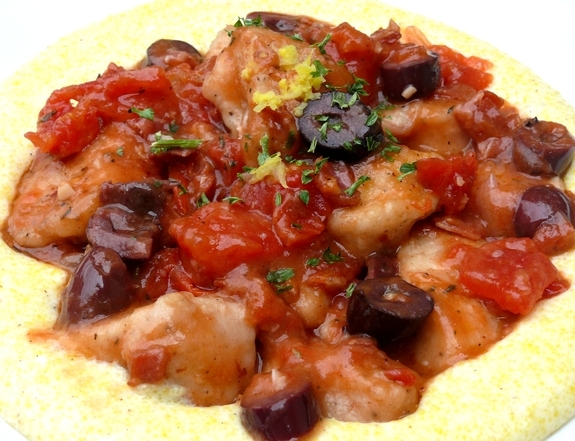 I loved my chicken marengo that I made, but it was a production! Well worth it, but an afternoon event. Can’t wait to try this. I love this recipe. I’m kinda sweet on any recipe that includes olives with a robust flavor. Your photos make me hungry! I commented on this post, but put it on the wrong one. So I will just reiterate: Love the photos, mouthwatering. Because I loved the cheesy grits and shrimp last night, I know I would love the cheesy polenta! I love this recipe! Made it last night and it came out wonderful. I did it extra spicy style. The lemon zest and lemon juice in the polenta really makes this dish pop! Thanks! A great meal AND a history lesson! This was a top-notch dinner last night! 🙂 Much love!